The Cats Tripe: The View from Thoreau. I am not within the life I imagine and my inspiration is gone. A momentary lapse of reason meant that the blog nearly disappeared entirely, but for the time being I've decided to let it sit and bide its time until I'm ready to try again. i am so glad! reading your blog has brought me through some dark times lately - you remind me of the importance of nature and the seasons and of growth, when sometimes all i can see is walls and dead ends. hugs. Must admit reading your blog always brings me some cheer and was missed greatly!. Keep up the good work, my sanity in this grey office cube is at risk without the blog!. 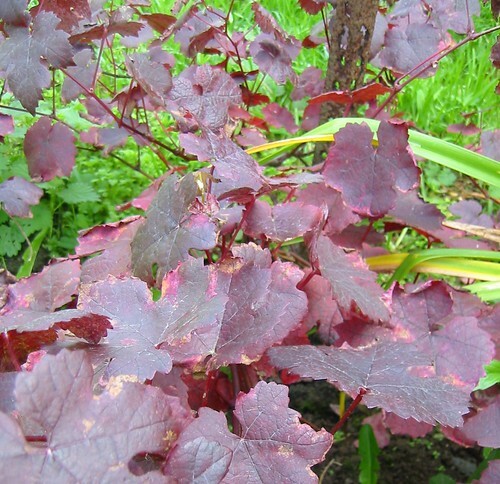 Is that a heuchera in your photo? I love them. Thanks everyone. It means a lot to me. Not quite sure when things will be back to normal whatever that is, but we're getting there. ramtops, it's actually a purple leaved vine, Vitis vinifera Purpurea, which I have treated cruelly for many years by confining it to a pot where it barely survived. Now it has its toes in good Normandy soil it's beginning to reach its true potential at last.